The Los Angeles/Long Beach port complex is fully operational again after an eight-day strike that shut down 10 of the complex’s 14 terminals. Late in the evening on Dec. 4, International Longshore Union Local 63, which represents about several hundred clerical workers, and the LA/Long Beach Harbor Employers Association, which represents 14 shippers and terminal operators, managed to reach an agreement on a new contract that runs through 2016. Neither side would initially reveal details of the contract. The strike, which began at noon on Nov. 27, was launched after more than two years of negotiations. The clerical staffers had been working without a contract since their previous three-year pact with management expired June 30, 2010. The main sticking point in negotiations wasn’t believed to be wages, but outsourcing. The union had contended that management wanted to implement new technology that would lead to fewer human workers being necessary. The employers’ group had maintained that implementation of new technology is needed to improve efficiency. But the ILWU has specifically opposed technology that would allow customers to directly access booking information, saying it could lead to the outsourcing of jobs. The union had also sought to have language included in the contract specifying that workers would not be laid off. “Our campaign was always focused on securing good jobs and stopping the outsourcing that threatened working families in our harbor communities,” ILWU International Vice President Ray Familathe, who helped coordinate the strike and assist the local in negotiations, said. During the strike, 20 ships were rerouted to other West Coast ports, according to the Marine Exchange of Southern California, while another 13 vessels were idle in and around the port complex’s waters. Although Local 63 only represents about 800 dockworkers at the port complex, its strike was effective because it was honored by its much larger sister, Local 13, which has about 7,000 registered members and represents almost 20,000 part- and full-time longshore workers who discharge cargo at the adjoining ports. The Port of Seattle Commission on Dec. 4 approved a 25-year program that it says should position it to help create 100,000 new jobs in the region while at the same time reducing the port’s environmental footprint. The port’s Century Agenda program identifies four strategies for the port to pursue with its business partners and stakeholders, augmented by four regional initiatives that identify near-term opportunities for regional coalitions to collaborate. The port’s strategies and objectives include positioning the Puget Sound region as the premier international logistics hub; advancing the region as a leading tourism destination and business gateway; using the port’s influence as an institution to promote small business growth and workforce development; and ensuring the port is the greenest and most energy efficient port in North America through implementation of a multi-faceted approach to reduce energy use, air pollutants, carbon emissions and storm water runoff. The four regional initiatives include strengthening access to global markets and supply chains for Northwest businesses; making Washington a preferred destination for international tourists; establishment of an educational consortium to serve the needs of maritime industry for workforce development, applied research and business growth; and fostering a coordinated effort between Puget Sound ports to support Washington state’s pursuit of a healthier Puget Sound by encouraging Puget Sound ports and other regional organizations to work together to restore the vitality of Puget Sound and protect and improve the shared environment. More details of the plan can be found at http://www.portseattle.org/About/Commission/Pages/Century-Agenda.aspx. Port terminals that were negatively affected by the eight-day strike at the Los Angeles/Long Beach harbor complex will have some cargo fees waived to provide financial relief and help expedite container movement, the ports have announced. The two ports normally assess fees on cargo containers that linger on its terminals beyond a certain grace period, but they have waived their portion of cargo fees incurred or impacted by the forced closures. At the Port of Los Angeles, free time for demurrage has been extended to all merchandise from Nov. 27 through Dec. 7, meaning that merchandise on port terminals during that period are not subject to demurrage. At the Port of Long Beach, a similar waiver period for cargo fees has been established for the three terminals that were shut down by the strike – Long Beach Container Terminal at Pier F, International Transportation Service at Pier G and Total Terminals Intl. at Pier T.
Importers, exporters or their agents should contact service providers such as ocean carriers or terminal operators for more details on cargo fees. ILWU Local 63 and the LA/Long Beach Harbor Employers Association reached a tentative agreement the night of Dec. 4 and all terminals at both ports were open the following morning. “Hundreds of thousands of jobs are dependent on our local ports, so the work now begins to clear the backlog and to get our economic engine humming again,” Lytle said. The Port of Los Angeles says that a newly passed city ordinance is expected to streamline the permitting process for future port construction projects, allowing the port to move ahead on its five-year, $1.2 billion capital improvement plan. The ordinance amends the city’s building code by streamlining it to provide a more efficient permitting process for maritime projects. “Through the establishment of this project permitting agreement with the Department of Building and Safety, the port can now move forward in an expedited manner with projects that will increase cargo movement capacity and terminal efficiency while simultaneously reducing the environmental impacts of port operations to our surrounding communities,” Los Angeles City Councilman Joe Buscaino said. The port’s capital improvement projects include spending $1.2 billion over the next five years to provide superior cargo terminals, rail and warehouse infrastructure to retain and attract top business tenants from around the world. The port is also spending a portion of its capital budget on community, recreational and educational projects. “The Port of Los Angeles is one of our region’s greatest economic engines, so it was vital that our city family work in unison to streamline permitting operations for which the Harbor Department has unique expertise,” he said. China’s recently announced plans to board and search ships that enter what it considers its territory in the disputed South China Sea. 800 ILWU Local 63 Clerks walking off the job in opposition to technological advances, and taking 7,000 Local 13 workers with them. The pact (finally!) between Canada and Denmark over their shared Arctic Sea border. But instead of scolding longshoremen or signaling alarm at China’s sudden appetite for expansion, we’ve decided to use this month's column to remind our readers of the charities that work year-round to make a difference in the lives of those less fortunate, and their particular need during the holidays – this year more than most. A charity near to our heart here at Philips Publishing Group is the Catholic Seafarers’ Center of Seattle (www.catholicseafarercenter.org). The Seafarer’s Center, which opened its doors in 1940, is a social service agency in the Catholic Archdiocese of Seattle, whose mission is to meet the spiritual and practical needs of seafarers and maritime workers visiting and living in Seattle. The center is open from 10 a.m. to 4 p.m., Monday through Friday, and offers seafarers the opportunity to relax among their peers and enjoy coffee, tea, and pastries (donated by Starbucks) or soft drinks and snacks available for purchase. 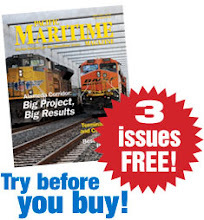 They can take a complimentary copy of Pacific Maritime Magazine from a beautiful wood magazine rack donated by our friends at Crowley Maritime in memory of our founder, Richard H. Philips. In addition to games and activities like ping-pong, pool, and foosball, there are several computers and printers available to check email or print documents. The center also provides a bank of telephones, and staff sells phone cards, SIM Cards, stamps, postcards, and other items often requested by seafarers. The center provides assistance with money transfers at a nearby banking location and directions and excursions to neighborhood drug stores, convenience stores, and attractions. The center’s chaplain Fr. Tony Haycock, is available to come on board visiting ships to say Mass, hear confession, and make other pastoral visits. In San Pedro Bay, the International Seafarers Center, (562-432-7560) located at the Port of Long Beach, is a full-service, non-profit, non-denominational seamen’s facility operating in the harbor area. The center offers free van transportation for officers and crewmembers from marine terminals to the center and to local shopping. The center offers many of the same services and amenities as the Seattle center, and is open afternoons and nights until 11 p.m. Both of these centers provide a clean, safe environment for seafarers who are far from home during the holidays, and always need donations, which are tax deductible, from individuals or organizations. Another group that needs help over the holidays is the US Marine Corps Reserve. They don’t want you to storm a beach or jump out of an airplane, but they can really use your help with their Toys for Tots program (www.toysfortots.org), which collects new, unwrapped toys during October, November and December each year, and distributes those toys as Christmas gifts to less fortunate children in the community. Visit the website to find a drop-off location near you or just send cash online from your desk, and imagine the joy your toy will bring to a child. Another great charity to remember during the holidays is the Wounded Warrior Project, which serves veterans and service members who incurred a physical or mental injury, illness, or wound while serving our country on or after September 11, 2001, and the program helps the families those who served as well. Individuals can donate at www.woundedwarriorproject.org, and companies can register to raise funds for the program at the same site. Finally, the Salvation Army (www.salvationarmyusa.org) is helping those who have little or nothing this holiday season with services such as food, shelter and emotional support, including those Americans who were left with nothing in the wake of Hurricane Sandy. Individuals can drop a few bucks in a red kettle or donate online, and companies and organizations can sign up for monthly “sustainer” programs. The new year will no doubt bring many opportunities for us to comment on China, the ILWU and Arctic navigation, but for now we’ll enjoy the holidays with our families and wish you all a Merry Christmas and a Happy (and prosperous) New Year. Correction: One of our astute readers, Max Denise, pointed out that a word we used several times in this space last month, liquefecation, was not really a word. He’s right – the correct word is liquefaction, and we regret the error, and while our opinion is that liquefecation should be a word, we’ll use liquefaction to describe the conversion of methane from a gas to a liquid from now on.